Astro Algebra acts like a wide array of interactive worksheets with many advantages over a booklet of dry questions. Produced by a practising teacher, it fits in well with the current curriculum and teaching methods. Like many such apps with game-like elements, Astro Algebra uses the word 'game' to describe itself and, as with the other apps, this is a stretch of the word’s definition. The tendency to use this word can lead to disappointment when really there is nothing to be disappointed about. In Astro Algebra’s case, the maths practise and tuition provided will be far more enjoyable for children than a traditional worksheet while actually adding to the educational value of the exercises. The game-like elements are high quality. The graphics are stylish and consistent. The electronic and dreamy sounds match the astral theme of the app. The tutorial sections prepare children for the main task very well. The essential task in the app is to answer the questions that appear. Sometimes these are multiple choice and sometimes freely entered using a custom keyboard. This doesn’t ‘feel’ like a game but it does feel like a superb, self-marking, attractive and long-lasting activity that builds understanding and offers useful practice. Each answer is awarded a number of stars that are a result of quickness and accuracy. There’s another game-like element here as children are encouraged to repeat activities to get all of the stars. Before each activity, children can read through a concise but thorough and clear explanation of the concepts that are covered by the following questions. They use the same formatting and graphics as the actual questions so they ease children towards what they need to understand. A quick practice can be taken next or children can dive straight into the main activity. A feature that so many apps leave out is the ability to reset its recorded data easily. While preserving the scores and accomplishments is useful for an app used by a single child, this is a luxury unavailable in many classrooms. Deleting and reinstalling apps is one way to reset their data but is at best a chore and at worst impossible for a teacher on a school-administered device. Astro Algebra can set itself up afresh for a new user at the tap of a button. Sadly, the other simple function that can make an app ideal for the classroom is not present. A demonstration option that takes away timers and so on would have fitted really well with this app and allowed teachers to use it as a source of examples to be shown on a class display. The timer prevents the teacher setting the pace and drawing out children’s suggestions. This is not the app’s prime function but it would have been a simple way to add to the app’s value – perhaps it might come in an update. 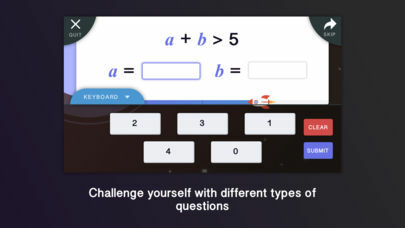 Interestingly, the app covers the algebra taught in the latter part of primary school and the first part of secondary. This is a useful feature as it provides some consistency in children’s learning in this key subject at a time when their education is otherwise going through the upheaval of changing schools and teachers. The app’s coverage of its subject is superb. It breaks it down into ten separate topics each of which are crucial to a child’s mastery of algebra. As well as providing the app with depth, these give it good longevity. 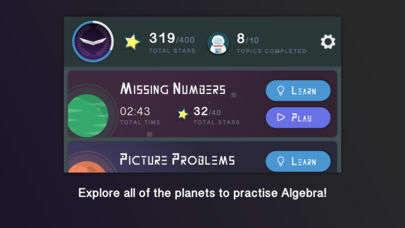 For children, Astro Algebra will make algebra learning and practise more enjoyable. For teachers, it will add variety to their lessons and reduce their marking too. 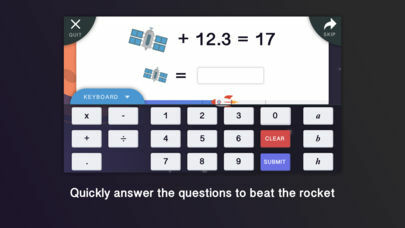 Parents might find it useful to polish up their own algebra knowledge so that they can support their children both with this app and in general. 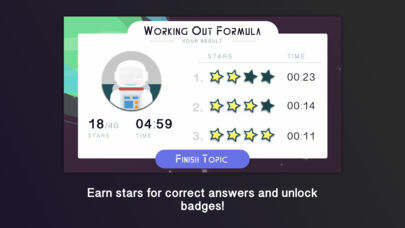 No, Astro Algebra is not a game but it is a high quality and useful alternative to dull worksheets. Learning how to do algebra should be fun as well as educational! Astro Algebra lets all space cadets explore 10 planets to conquer different ks2 & ks3 algebra topics. 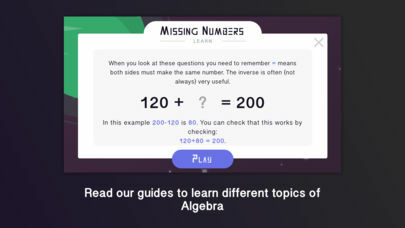 In Astro Algebra math games lets children get to play quick-fire algebra questions on a range of different algebra topics. For each of the 10 algebra planets (topics) there is a learn section with numerous examples explaining how to solve that specific type of algebra for beginners.